Peter Pan’s Flight is one of Mike’s Favorites! Hello everyone, and welcome to another of our series of Mike’s Favorites at Walt Disney World! It has now been about 19 months since our last trip to Walt Disney World — which for us, feels like an eternity! I know that it isn’t, and that there are many great things to do that don’t involve Disney, but for me and my family, I think we are ready for that next trip whenever it should happen. In today’s post, we’re taking a look at another of my favorites — that classic attraction known as Peter Pan’s Flight! Peter Pan’s Flight is a continuous run attraction located over in Fantasyland, across from the attraction “it’s a small world”. In the past, the problem that this attraction always had was a slow moving line and FastPass selections that would run out quickly. Since it has been a while since we have been there, things have changed as they redid the queue area. Has that made an improvement in your opinion? Please leave me a comment and let me know what your opinion is. 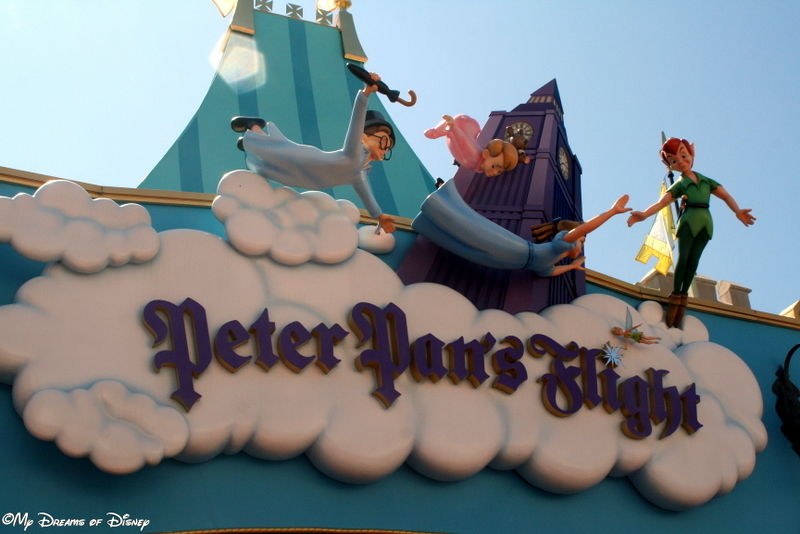 Peter Pan’s Flight is one of the few attractions at Walt Disney World that utilizes a hanging system of propelling the galleons throughout the scenes, which feature Wendy’s bedroom, the scenic view of London below, Mermaid Lagoon in Neverland, and other recognizable scenes from the movie. Like the Disneyland version, Peter Pan’s Flight at the Magic Kingdom is an opening day attraction, opening on October 1, 1971. The Disneyland version is one of the few attractions at Disneyland that is still in operation over 60 years later. Interestingly, the Disneyland version does not offer a FastPass option, but the Magic Kingdom version does. Also, the Disneyland version features galleons that stop for loading, unlike the Magic Kingdom version, which uses the Omnimover style of loading similar to what you find over at The Haunted Mansion. What I really like about Peter Pan’s Flight is the forced perspective elements that are introduced. For example, I really enjoy the feeling of flying through the sky, and how high up we are over the London skyline. Also, as you progress through the attraction, the story is told, scene by scene. For us, Peter Pan’s Flight is one of our favorites at the Magic Kingdom, and one that we can’t wait to experience again. What about for your family? Is it a family favorite, one you can “take it or leave it”, or one you absolutely don’t do? Let us know in the comments, and thanks! 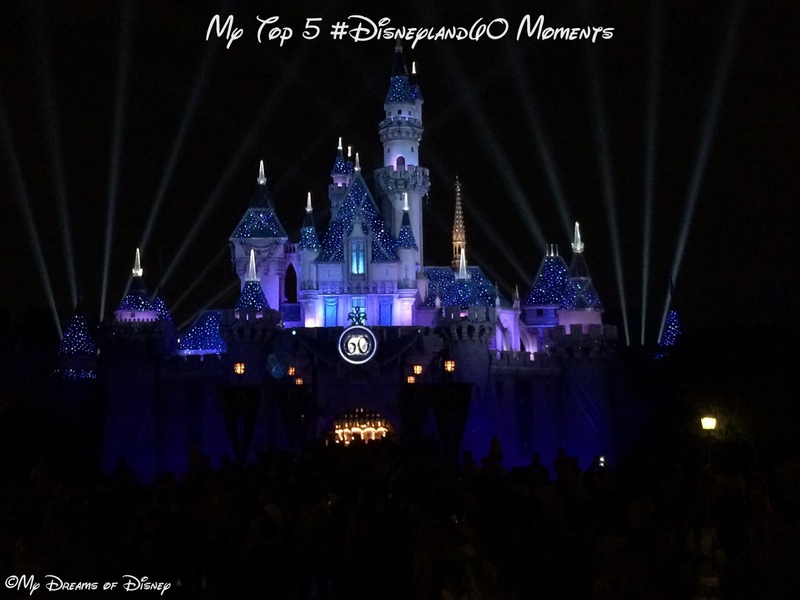 These are my Top 5 #Disneyland60 moments! Hello everyone, and welcome to our Top 5 Disneyland60 Moments from 2015! I hope that 2015 has been a great year for you, and that 2016 is an even better year than this one! This has been a hard year for my family, as I wrote about in my post “When Life Invades Disney“, but I am going to be optimistic and tell you that I expect 2016 to be a much better year than this one! So today, I’m going to pull for you my top 5 moments from our trip to Disneyland for Disneyland60 this past July! Stephanie, Shane, Lindsay (not seen), Sophie and I getting our picture taken on July 17, 2015! 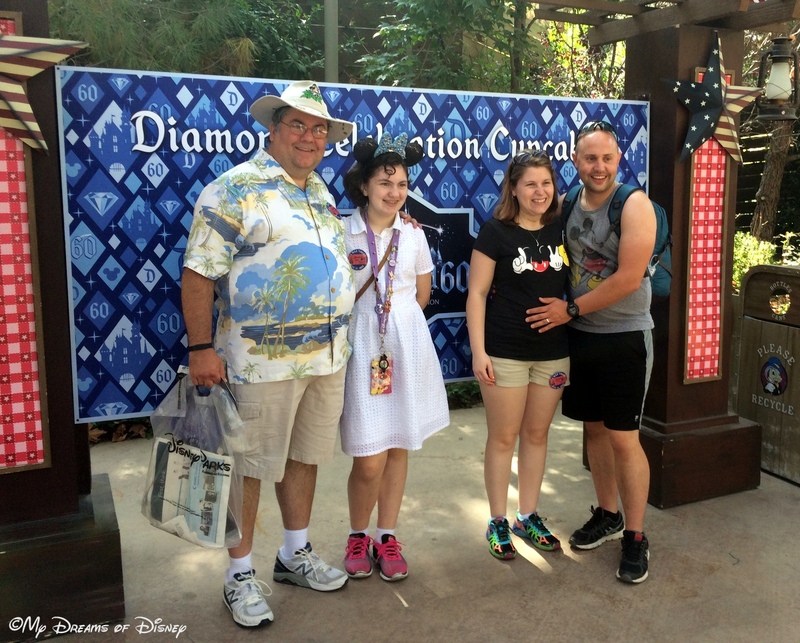 On the actual birthday of Disneyland, July 17th, we were able to be at the park! It was a big thrill for myself and Sophie; having Stephanie and Shane and their baby to be there also made it special. The only thing that I missed was not having Cindy there with us. That’s okay, though, the 50th birthday of the Magic Kingdom is in just a few years, I’ll make sure we are there for that one to celebrate in style! Moment #2: Riding all the Attractions we did! That morning, we arrived early enough that the park was just getting going, and were able to get in to Disneyland with not much fuss. I was, to be honest, a little surprised, because I remember how crazy packed the Magic Kingdom had been for the 40th Birthday just a few years earlier. So we arrived, and looked in the gift shops briefly on Main Street, but then we started riding attractions. We must have ridden 10 or 15 attractions — rides like the Jungle Cruise, Splash Mountain, and others — within the first couple of hours of being there — well before the 10AM presentation that they had to celebrate the park and the occasion. It was incredible how many rides we just walked right onto. We saw the World of Color the night before the anniversary — so, on July 16th. This was a special World of Color, hosted by Neil Patrick Harris, Mickey Mouse, and even an appearance by Walt Disney. I had a Periscope session for this, as well as for Moment #4 and Moment #5. On July 18, we had reservations at the River Belle Terrace to enjoy dinner and get preferred seating for Fantasmic. The meal was incredible, but alas, the show was cancelled that night due to rain. However, on the 20th, Stephanie, Shane and myself went over to see the show on our own, and the video below is my Periscope video of the showing, which is why it isn’t 16×9. I hope you enjoy! Within minutes of the Fantasmic show ending, the Disneyland fireworks were being presented. Rather than try to get over by the Castle and possibly miss getting a good spot for the fireworks, we decided to stay where we were and watch them from that location. I think it was a good decision, and I have this video as well to share with you! Once again, it was recorded as my Periscope session, so that’s why it isn’t 16×9. Enjoy! What special Disney moments will 2016 bring to our world? And what special Disney moments do you have from 2015 that you want to share with us? Hit us up, leave us a comment, shoot us an email, write on our Facebook Page, shoot us a tweet, or even give me a call! I’d love to hear about your favorite Disney moments from 2015! I hope that you all have a very happy and safe new year celebration and that you have a wonderful year ahead! Starting today, December 28, 2015, you can save up to 25%* on rooms at select Walt Disney World® Resort hotels for stays most nights April 14-June 11, 2016 when they book by March 31, 2016. Ask about other great rates for stays most nights Feb. 22-April 13, 2016. Plus, you can receive 1 more ticket day FREE when they upgrade to a room and ticket package with a minimum 4-day Magic Your Way® Ticket. It’s a perfect time for your Clients to discover all-new Star Wars™ adventures at Disney’s Hollywood Studios, the Garden Rocks™ Concert Series at Epcot® International Flower & Garden Festival, the new nighttime experiences at Disney’s Animal Kingdom® Theme Park and so much more. *The number of rooms allocated for this offer is limited. Length-of-stay requirements may apply. Savings based on the non-discounted price for the same room. Additional per-adult charges may apply if more than two adults per room at Disney Value, Moderate and Deluxe Resorts. Cannot be combined with any other discount or promotion. Advance reservations required. Offer excludes campsites, 3-bedroom villas, Bungalows at Disney’s Polynesian Villas & Bungalows and Disney’s Art of AnimationResort—The Little Mermaid Standard Rooms. 25% savings for select Disney Deluxe and Deluxe Villa Resorts; lower savings may be available for other Resorts. Everyone in the same room must be on the same package. Guests can choose from Disney’s Saratoga Springs Resort & Spa, Disney’s Old Key West Resort, Disney’s BoardWalk Villas, The Villas at Disney’s Wilderness Lodge and Disney’s Polynesian Villas & Bungalows. They’ll also enjoy exclusive savings just for Disney Visa Cardmembers. This offer must be booked by Feb. 28, 2016 for travel April 3-June 30, 2016. Subject to availability. Number of rooms allocated for these offers is limited. Length of stay requirements may apply. Savings based on the non-discounted price for the same room. Remember, I can help make your Disney vacation a reality! Shoot me an email, give me a call at 919-606-6725, or even leave me a comment and I’ll reach out to you. 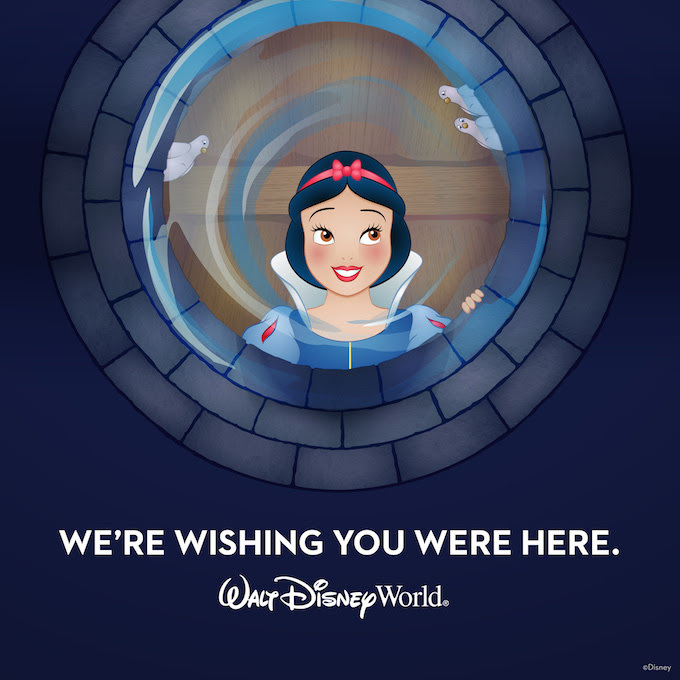 Where will your Disney Dreams take you next?